Greg Stanton, and his wife Nicole France Stanton, celebrate Stanton's victory in the Phoenix mayoral election. Tuesday was election day and Phoenix elected a new mayor. 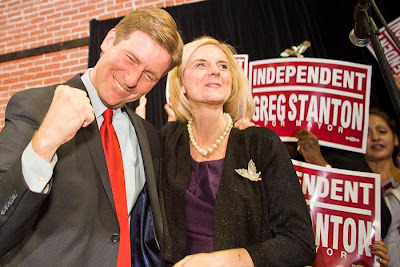 Greg Stanton, a former Phoenix city councilman and former Deputy Attorney General, handily beat Wes Gullett, a former lobbyist with a long history as a Republican political operative. In Mesa, long serving Senate President Russell Pearce was recalled, losing to Jerry Lewis, also a conservative Republican. Pearce was the author of SB 1070, one of the toughest anti-illegal immigration laws in the country, and other anti-immigration efforts. He sponsored numerous bills to loosen Arizona's minimal gun control laws and tax cutting legislation. He was a darling of the Tea Party and one of the most conservative people in a very conservative state senate. Lewis' campaign was built around one simple issue: he wasn't Russell Pearce. He is in step with Pearce on many issues, but this race revolved around personality and Lewis was the winner.